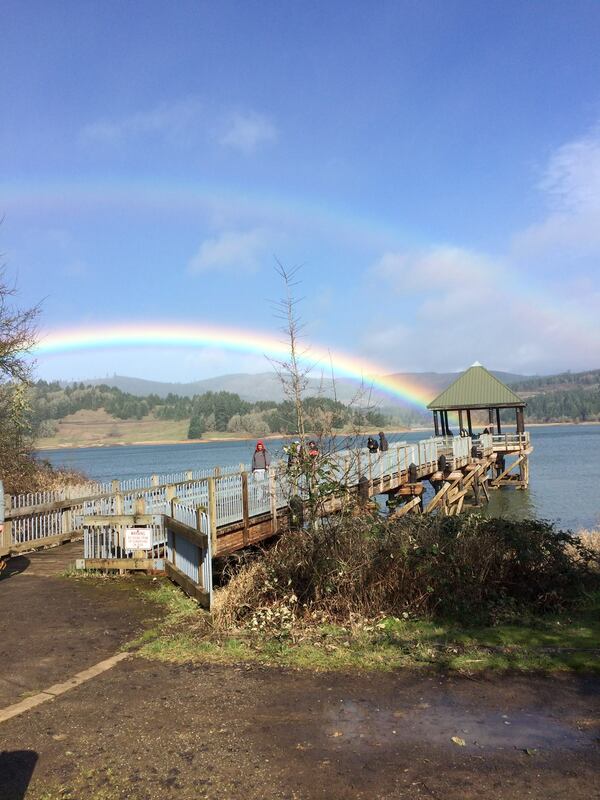 Tucked between the metropolis of Portland, Oregon and the Northern Oregon Coast Range, sits Henry Hagg Lake. Fully stocked for year-round fishing, this tranquil body of water is nestled among the nearby 40 wineries that produce some of Oregon’s finest varietals such as Pinot Noir. While wine tasting might be a popular activity during Oregon’s rainy months, the Hagg Mud 50K & 25K is a February ultra that’s had a cult-like following for over 15 years – and for good reason. Most Pacific Northwest trails offer soggy patches and puddles due to the amount of moisture during the winter and springs months. But the mud at Hagg Lake is spectacular. The 50K course follows a brief out-and-back on a nearby gravel road and then proceeds to skirt the perimeter of the lake, a distance of 14 miles, twice. In 2017, Oregon received a record amount of precipitation, with 145 days of rain between October 1 and April 26, which meant that this year wouldn’t be nearly as muddy, or so I thought. Under a mist of light rain showers, about 100 runners stood at the start near the lake’s shoreline early Saturday morning. A heavy layer of fog made it impossible to see across the water, but everyone knew what seemed inevitable – mud. Growing up in the Pacific Northwest you get used to soggy shoes, black spots on your backside after running around a rubber track in the rain, and muddy shoes after walking just about anywhere. The trail around Hagg Lake is rolling, while runners traverse under lush forest canopies, across open meadows and through walls of blackberry vines that offer no forgiveness to runners hoping to grasp a steady branch. Under foot, the mud seemed to come in three different consistencies this year: sticking, slipping and sucking. Whether it was sliding up and down hills or just slogging across a flat meadow, there was a consistent presence throughout the course which meant little to no reprieve from the clay-like mud baths. Loop number two meant the mud was slicker and sloppier, but the rain had subsided and runners were treated to sunshine and rainbows. With portions of the course labeled “slip sliding away” and “pig pen,” the race directors at Hagg Mud know how to keep a sense of humor as runners continue to forge onward. There are no words for the layers of mud that were caked on my shoes, as well as the backs of my calves. But I crossed the finish line grateful for the unique experience of slogging miles through the mud, knowing that the end of winter is fast approaching. Hagg Mud not only offers a 50K but a 25K held the next day, and those who are looking for a back-to-back can complete a double (50K & 25K) run. This year, Race Directors kept trash to a minimum and recycled or composted most of the event’s waste. Runners can also expect stellar aid stations and a post-race spread that includes grilled cheese sandwiches and homemade soup. Some might prefer to stay warm inside during winter months, but this was my favorite way to spend an afternoon in the Pacific Northwest. The race directors were 100% committed to reducing waste. With a vision of zero waste and a mighty team that included runners and top-notch volunteers, after two days (and two races), Hagg Mud generated only four pounds of waste! We know running is good for us, but it should also be good for the planet. Three amazing ladies co-direct this race: Karen Peterson, Teri Smith, and Laurie Westenberg. They work their butts off year-round to make sure the runners have the best experience possible – – including special, secret rain dances so as to not disappoint in the mud department. If you run the double, you get a growler of your choice of beer, hard cider, or root beer. Check out the Hagg Mud Runs. You’ll love it!